“Every year this event gets even better!" was overheard at our table as everyone stood to applaud Sarah Friar at the conclusion of her honest, amusing, and inspiring remarks at the 2014 Financial Woman of the Year Luncheon on October 2nd at the Westin St Francis hotel in San Francisco. Over 750 attendees attended the 19th annual event and were both captivated by Sarah's remarks and impressed by the ambitions of this year’s eleven scholarship recipients. As Sarah highlighted in her speech, as an ambitious young woman from troubled Northern Ireland, she herself was the recipient of a life-changing scholarship to Oxford. 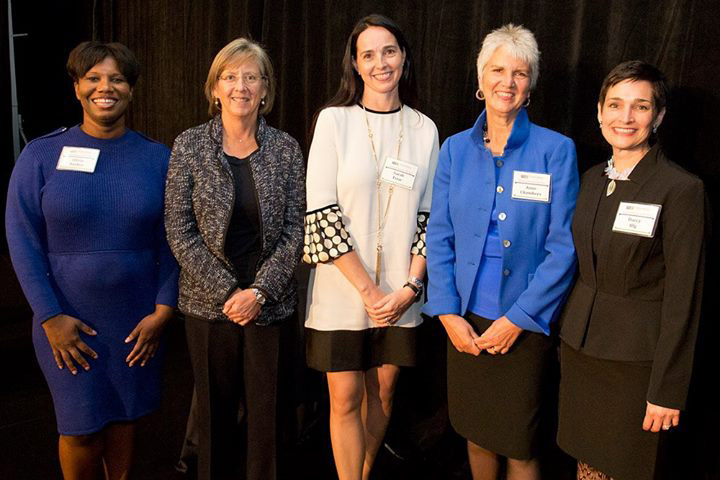 She applauded the important work FWSF does to provide scholarships to deserving young women, help them launch successful financial careers and enable its members to thrive as they progress from job to job. In fact, thanks to our sponsors and individual donors this has been yet another record year for our scholarship fund with over $320,000 raised. Since July 2012, Friar has served as the CFO of Square, which offers merchants of all sizes intuitive, yet sophisticated technology to run their business. Prior to joining Square, Friar served as Senior Vice President, Finance & Strategy at Salesforce.com. Her career began in roles at Arthur Andersen and McKinsey & Company followed by 11 years at Goldman Sachs. Sarah is both extremely accomplished in her own career and enormously committed to a future with more women in financial and technical fields. Her efforts to inspire young women to pursue their education and dreams are in line with the goals of the FWSF. 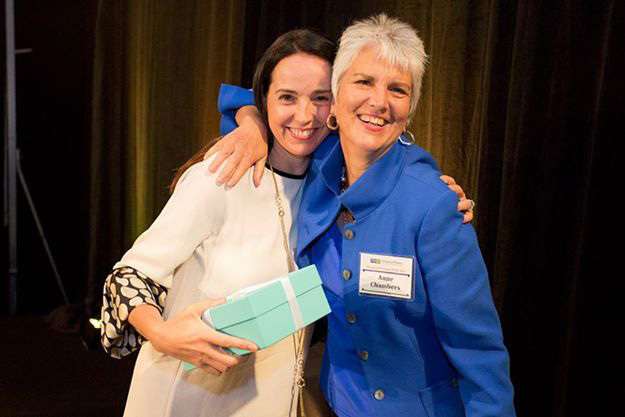 She is an outstanding role model for our scholarship recipients and the entire FWSF community. 1. Get a daily adrenaline rush. Easy to say and yet so many of us spend most of our professional lives trying to get in control of our subject matter, effectively removing the adrenaline. But if I’ve learned anything so far it’s that it’s taking those big risks is what makes it living. Sarah went on to share her adventurous summer internship working in Ghana's Ashanti Goldfields: I learned what working on a mine was like. I saw science practically deployed. I was fascinated by how microbial systems could be used to extract gold from sulphide ore. I was part of a huge plant of people, all using the techniques I’d only practiced in a small lab on a gigantic scale – it was mind-blowing! Yes, it sounds trite, so how do you practically do that? Take a step back and think holistically about what you are passionate about. It’s not about listing jobs, but rather listing attributes and then figuring out if the job has the attributes. Analytics – I’ve never met a number I didn’t like. Technology – I love taking things to pieces, starting with my mum’s vacuum cleaner. I grew up in a tiny village called Sion Mills, in N. Ireland at the height of the troubles. Our local town had the dubious honor of being the most bombed town in Europe per size. Sad to say that bombs and shooting were somewhat par for the course from my earliest memories. So imagine me sitting in our school career room one day and seeing an advert in a career magazine for the Arthur Andersen Scholarship Program. Little did I know that this would open the door to so much. A love of business, a love of travel, an ability to pay for my education at Oxford and a chance to expand my horizons. When I first saw it I thought – they’ll never accept me. In fact a little known story – I got in such a fluster ahead of my interview that I managed to show up on the wrong day. See the pinball machine in action…..I don’t recommend it as a way to make yourself differentiated. So you see today is the rebalancing of karma. And now you all have to pay it forward when your time comes! Because we all see your potential. 4. Create a Board of Directors, and use them mindfully. This I stole wholeheartedly from an amazing Goldman woman. I’ve taken some creative license but the punch-line is be very mindful of cultivating great mentors – in the same way you would be thoughtful about creating a Board for your start-up. And stretch. When I was first starting in banking Mary Meeker was the doyenne of Wall Street – on the cover of Fortune, Forbes the WSJ (in fact she still is in all those places! )….I never thought I’d get to call her a mentor and friend. When I was deciding what to do next after Goldman I stalked Marc Benioff for some guidance. I ended up working for him for a year and a half. Today I get to work with Jack Dorsey and see one of the greatest game-changers in tech in action, and he gives honest feedback too! Look for folks who will give you brutal honesty, but can deliver it in such a way that you look forward to doing what they are advising. You know they have your back. So scholars – there’s a lot that lies in front of you. Your stories are inspirational. When I heard your intros a few months back I thought of the great Warren Buffet. When asked how he’d been so successful he said: “because I only had to compete with half the population. Well times are changing – Mr Buffet has some new competition on the scene and we’ve got your back. If you have not already contributed, please visit our scholarship page to learn more about the program and make a donation, if you are so inclined. We look forward to seeing you at the Financial Woman of the Year Luncheon next fall! View more images of the event on facebook!